Hmm, what is there to say about a classic cake? Well, I’ll say with if you’re at all intimidated by baking —especially a cake— but want to try your hand, start here. It’s pretty much fool proof and is a great basic to have in your recipe box. I left the frosting vanilla for contrast in color and flavor, but a chocolate frosting would be ah-mazing!! You could even use both the cake and the frosting recipes as a good base to jazz up and make whatever fun variations you want with them! Chocolate with peanut butter frosting and Reese’s pieces between layers? SURE. You get the idea. To get even stacks (and thus a straight standing cake - unless the leaning tower of Pisa is your cake’s theme), make sure to use a serrated knife and saw off the rounded tops after the cakes have fully cooled. You’ll want to keep your discs as flat and parallel, top to bottom, as possible. I alway put serrated side down. This allows you to use the frosting to fill, all while guaranteeing your top to be flat. 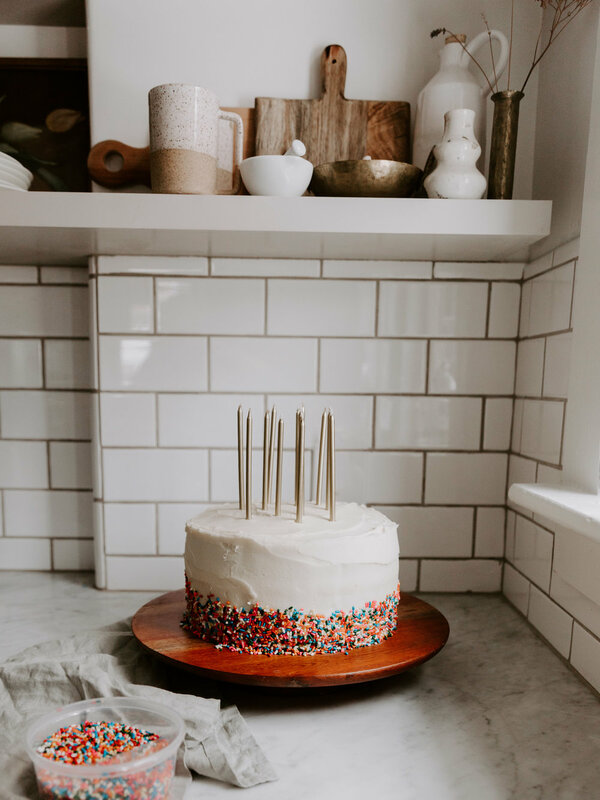 Don’t be afraid to use 3-5 skewers to stake your layers together while you crumb coat and set before the final layer of frosting. What’s a crumb coat? Just a thin layer of frosting on the outside of the cake that keeps the crumbs locked in and away from the final, thicker layer of frosting. Why skewer? Well, you want to give your frosting a chance to set with the heavy layers exactly where you want them. Just pull the skewers out before your final frosting. Don’t skip the butter and flour coat on your pans!! Don’t use a spray or an oil, just stick to good old fashioned butter and flour. Make sure to get every crevice possible! Because this is a 3 layer cake, you’ll inevitably be cooking them in different parts of your oven, maybe 2 on the bottom, one on the top, or whatever works. Be sure to rotate them around during bake time so that they cook evenly. Toothpick test is what you’ll want to do because chocolate is much harder to gauge color with. If one has cooked faster than the others, don’t be afraid to take it out earlier. I adapted this recipe slightly from The Stay at Home Chef, and she does a great job at providing variations for dietary needs. Check out her website to see her substitutions! Can be made chocolate with the addition of 1.5 cups dark cocoa powder. In a standing mixer with the whisk attachment, beat together butter and cream cheese on a medium-high speed until fluffy and light in color. Add vanilla extract, and if you are making the chocolate version, add cocoa powder. Mix until incorporated. Add powdered sugar about a cup at a time until a thick frosting is formed. Add milk to loosen to a spreadable consistency. The perfect chocolate cake to have in your recipe book! Preheat oven to 350 degrees. Butter and flour 3 9" cake pans. Tap out the excess, set aside. In a stand mixer, combine flour, sugar, cocoa, baking soda, baking powder, and salt. You may need to take a spoon to the bottom of the bowl to get everything mixed. In a large (5 cups+) liquid measuring cup, measure buttermilk, water, and oil together. Crack eggs into the mixture and add the vanilla. Pour the liquid into the dry ingredients, and mix on a medium speed until smooth, about 2 minutes. Scrape the sides and bottom of the bowl to make sure everything is mixed well. If you have a kitchen scale, measure the batter divided evenly into 3 pans. If you don't, it's about 2.5 cups of batter per pan. Slightly bang the pans against the counter if it looks like there are a ton of air bubbles. Bake for about 30 minutes, or until a toothpick comes out clean from the center of each cake. Cool on a wire rack for 10-15 minutes and then pop the cakes out of each pan and continue to let cool about an hour or more on wire racks. Frost with frosting recipe below. The Only Banana Nut Muffin Recipe You'll Ever Need!